Today I am posting at 299 so that means I am getting ready for my big 300th post giveaway. I will be showing you a sneak peek of 2 items that will be included in the prize package. I decided I needed to destash a bit and of course I love to make things to give away so here is a slight preview. I won't go into a lot of details in what these are, you may know as soon as you see them, 1 item I featured during the holidays and they were a hit so I decided to make a few new themed ones. 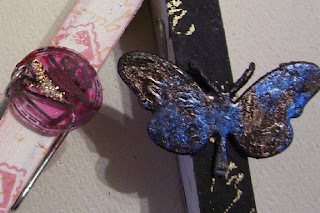 And I am on Pinterest and found a neat idea and sort of got addicted to making some of these with my burnt glue butterflies and some shrink plastic charms I recently made. 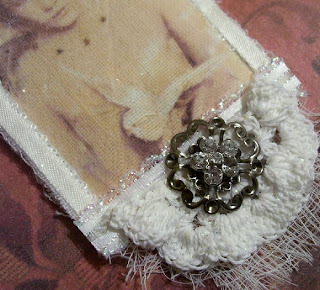 I am really liking making charms of late, not just shrink plastic but with beads and other items. Fun to add your own embellies especially with the stuff you have on hand. Believe me I really have more stuff and not sure how I managed so much but I know some of it comes from the lovely people I have traded with over the years. So much fun getting things from other places. So enough rambling...here is the sneak peek and stay tuned for the 300th post when I will give you the rules...and we have to have rules. If you would like or be so kind to add the button on the side bar to your blog you may just get another added chance to win. And over at Ink Stains with Roni, Roni is having her 3rd Annual Calendar challenge. 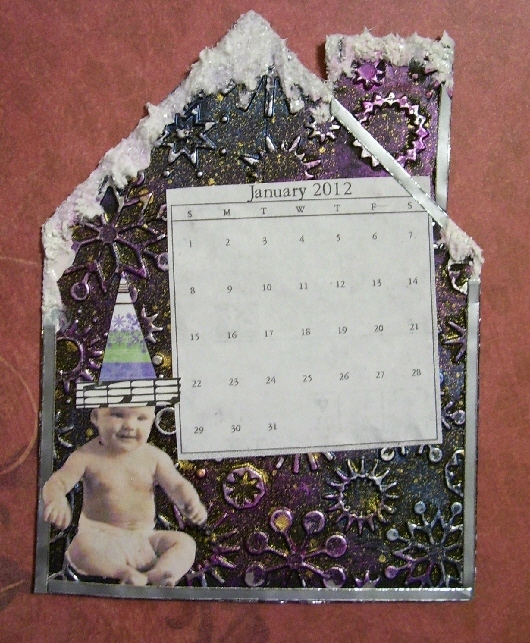 Well not so much a challenge but posting techniques for backgrounds and making a calendar for the New Year. So this year I decided since I only have 1 calendar for this year I would join in and what better way to learn some new things and use my art supplies I have on hand. If you want to check the techniques out go to the link I have provided and follow along. Roni is already on April, my goodness the time sure flies when you are creating. I have to show you my January calendar, I made the template a bit smaller (you can get it over on Roni's blog) because I will probably have it here in the computer room and I don't want a huge one. All the techniques are wonderfully demonstrated with clear instructions. This technique is painted tin foil, embossed in the CB. Then I added Twinkling H20's because I don't have any glimmer mists but I will be making my own this year. I just need good spray bottles. After my Twinkling's dried I wasn't really sure I liked it so I did have some Radiant Rain in gold and when I added that the colours and embossing just really popped. I added Delta Snow Tex for snow then when it was still wet I added Diamond Dust to it. Then I finished embellishing it. I have Feb and March just about done. Things are drying so I will feature them in a separate post from my 300th Giveaway post. Click on the image to see the wonderful colours and details. Thanks for dropping by and stay tuned for my next 300th post. I just put your 300th blog button on my blog! congratulations! Wow, 300 posts! Now who would have thought that you could talk that much? Congrats! I'll be back to sign up. I packed my ornaments away yesterday, so sad to see them go! Have a great weekend! Happy 299 and Happy New Year! Looking forward to more of your creations in 2012! I'm staying tuned for the big 300.....can't wait ! WOW, how gorgeous, Les! And I needed inspiration for a new project and this just gave me an idea of how I can do it!! (Did I mention I'm so grateful?) I hope you're having a great weekend!!! Awesome calendar page- love the gorgeous technique! And, what a fun giveaway! I'll add it to my blog sidebar when I get up today!